Minturn, CO – AUGUST 20, 2008: Most homeowners write off their crawl spaces as unusable space under their homes and choose not to go near the damp, dirty and sometimes moldy crawl spaces. 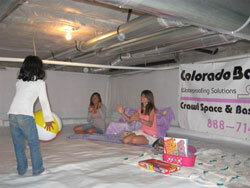 At the recent Healthy Homes Tour, Colorado Basement Systems LLC demonstrated that there is a solution for turning crawl spaces into usable, “green” healthy spaces. 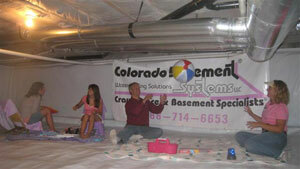 Colorado Basement Systems encapsulated a homeowner’s crawl space with a durable plastic liner which tour participants could climb into to experience the installed product. The Singletree property showcased in the tour is not an extreme example of water and moisture issues, but moisture in crawl space dirt floors can often cause odors, mold and issues such as buckling hardwood floors, smelly damp carpets and frost or condensation on windows. The air moves upward into the home and mixes into the air breathed daily by homeowners. Colorado Basement Systems is a franchisee for a company holding over 23 patents on products to reduce water and moisture and to keep homes dry and healthy. These patents include a 20 millimeter liner, thicker than the standard liner often used in homes and twice as effective, and the TripleSafe Pump, a sump pump with three pumps for extra reliability.